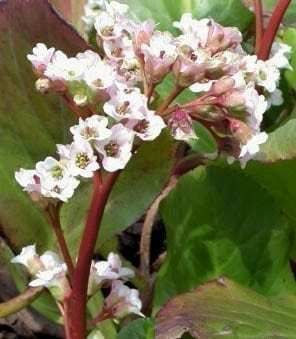 Bergenia ‘Silberlicht’ translates as ‘Silver Light’ to reflect the large trusses of pure white flowers on red stems in early spring. These take on a pink tinge as they age. The plant has evergreen glossy leaves which turn red during autumn and over winter. Superb early season colour and tolerant of any soil, including clay. AGM. Hardiness rating H6. Hardy and evergreen so just needs a tidy in spring. This is also when it can be divided and it also benefits from a general fertiliser at the same time.